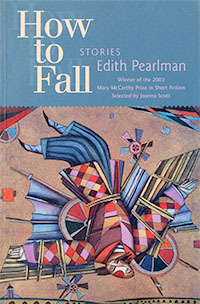 Selected by Joanna Scott as the winner of the 2003 Mary McCarthy Prize in Short Fiction, Edith Pearlman's How to Fall is a darkly humorous, deeply observant collection that welcomes the world's immense variety with confidence. The intense staff of an intense restaurant, a mother and daughter unfashionably enmeshed, a scholar whose passion is awakened by a message in a language he doesn't understand – these characters are the subjects of Pearlman's cool, studied focus, each rendered with such unpredictable intricacy that they often astonish themselves just as much as the reader. In the title story we meet Jocelyn Hoyle, a comic sidekick in an early 1950s television variety show. Like so many clowns, he is miserable. The tale opens when he begins to receive mysterious letters from a fan who calls herself The Lady In Green. It ends with a poignant, surprising twist. In “The Large Lady” a disgruntled “crusader against famine” gives an unseemly speech at an affluent party in Godolphin. In “If Love Were All” a woman of fifty leaves her home in Rhode Island to help refugee children in World War II London. There she endures bombings, betrayals, and the unsettling beginnings of peace. Spanning four countries and sixty years, these sixteen stories present characters dealing with love and death and other perplexities: how to live after resurrection, how to sell a diamond on the black market, how to say good-bye to your face. The title story describes the mildly charged meetings of an aging television performer, expert in pratfalls, and a club-footed teenage girl who announces her futile love for him. Pearlman skillfully encapsulates the girl's neediness and the performer's roadshow life… There's a similar deftness in “Rules” … Pearlman executes her own subtle magic. In her third delicately eccentric collection of short stories, the underappreciated Pearlman (Vaquita, Love Among the Greats) pegs characters as diverse as a comedian's silent sidekick, a 17-year-old girl newly independent from her two mothers and a PBS anchor who bemoans after a makeover, ' “You're not attractive, you know - you only look attractive.” More than half of the stories are set in Godolphin, a fictional Boston suburb where daily life is enacted in all its glorious monotony; several explore the mixed emotions roused by charity. In “The Large Lady,” an uncomely representative of a fundraising organization for starving kids manages to shake a gathering of suburban do-gooders from their complaisance, prompting one guest to reflect “Hell gapes for the merely emphatic”; in “Rules,” a dour mother and her home-schooled daughter rile the volunteers at a soup kitchen. Other stories revolve around twosomes: in “Home Schooling,” twin sisters Willy and Harry share a non-traditional childhood; in “Signs of Life,” Clara and Valerie have lived through the extraordinary and unimaginable, but consider themselves simply old and in love; in “Shenanigans” the elderly mothers of a dating couple meet and become friends: “They were each other's destiny, hinted the tall old Jewess. The tiny flower of Erin concurred.” Pearlman's light touch and wry tone give the stories a pleasant buoyancy. The year was 5707 by Biblical reckoning and 1947 by the Christian calendar. The Purim party at Camp Gruenwasser would begin after dinner. There would be pastries – hamantaschen: Haman’s hats. Without those pastries the holiday might as well be ignored; without those pastries the Megillah – the Tale, written on a scroll – might as well be stuffed into a cistern. Tonight’s necessary hamantaschen – they would be a joke. Men who had been chefs Before knew how to bake sachartorte, linzertorte, all kinds of sweets; but where was the sugar, where the nuts? Today, using coarse flour and butter substitute and thin smears of blackberry preserves, they would bake ersatz hamantaschen, one or two per individual. Sonya did not know whether the practical bakers considered babies individuals, though babies certainly counted to the Red Cross and the American Command – each infant received its own vitamin-laced chocolate bars and its own Spam and its own cigarettes.